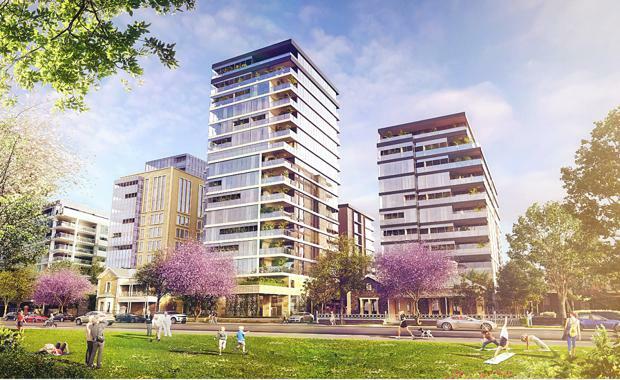 North Adelaide could be set for a major boost with a development application made for a ground breaking master planned $200 million mixed use project combining residences, serviced apartments and retail. Lodgement of the application for consideration by the Development Assessment Commission follows an extensive design development and review process. The plans as lodged for the project are supported by the State Government’s Office for Design + Architecture. In a dress circle location on Brougham Place (49-58) with expansive views across the city, the more than 90 high-rise residences are intended to provide new living and lifestyle retirement accommodation options in the form of elegant, contemporary, secure and spacious low- maintenance apartments. It is anticipated that future residents will have access to exceptional facilities including rooftop private dining, bar and meeting room and private internal gardens as well as concierge, chauffeur and other services. The development application also includes a 100-key serviced apartment building for short, medium and long term stay guests to be operated by a yet to be chosen professional serviced apartment operator, and incorporating ground floor retail, restaurants and cafes.